VANCOUVER, BC / ACCESSWIRE / September 20, 2018 / First Mining Gold Corp. ("First Mining" or the "Company") (OTCQX: FFMGF, TSX: FF, FSE: FMG) is pleased to announce final fire assay results and partial metallic screen fire assay results for eight drill holes completed to date on the Miller prospect at the Company's wholly-owned Goldlund property ("Goldlund") in northwestern Ontario, Canada. Previously the Company had released fire assay results for the first six drill holes of the eight hole campaign at the Miller prospect (see the Company's news release dated August 20, 2018). Note: Assaying for the Miller drill program is being done by SGS Canada Inc. ("SGS") at their laboratories in Red Lake, Cochrane and Lakefield, Ontario. Reported widths are drilled core lengths; true widths are unknown at this time. Assay values are uncut. 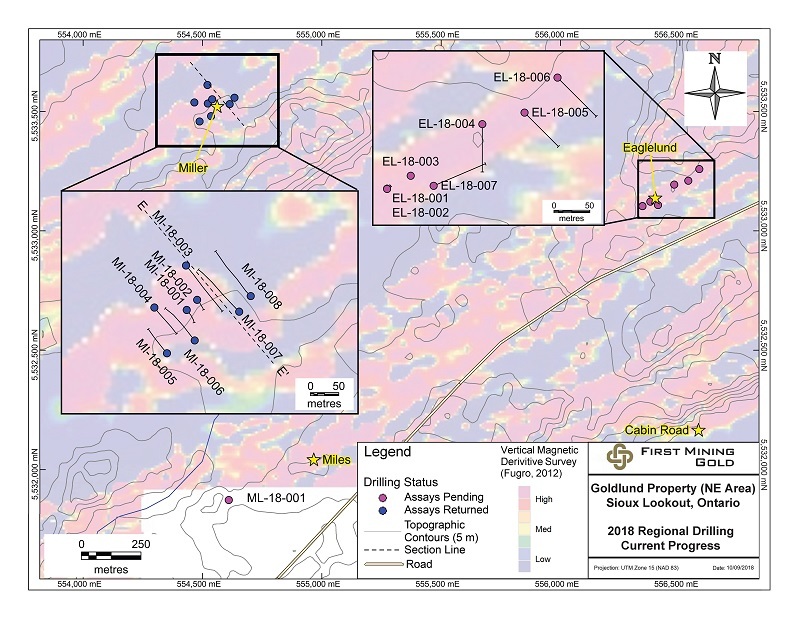 Jeff Swinoga, President and Chief Executive Officer of First Mining, stated, "We are excited with the continued drilling success of our Goldlund regional exploration program, indicating the potential for significant gold mineralization 10 kilometres from the initial gold discovery. This new discovery is encouraging in light of the property's 50 kilometre strike length. These two new reported holes, located at the Miller prospect, have both encountered gold mineralization, with several visible gold occurrences similar to the first six drill holes. The early results from the Miller prospect indicate that the entire width of the sill/dyke appears receptive to gold mineralization and this mineralization remains open along strike in both directions and also at depth." 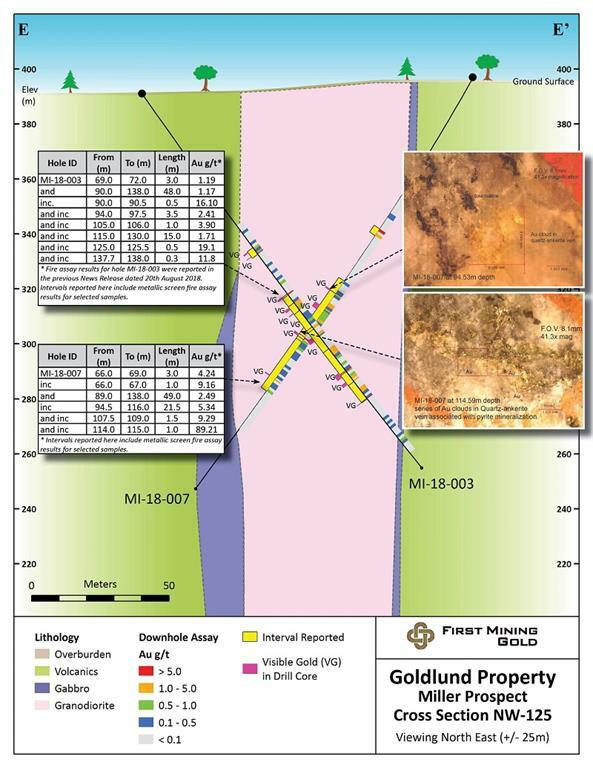 Due to the coarse, nuggety nature of the gold mineralization present within the Goldlund deposit and its surrounding regional targets, the initial fire assay results from the Miller prospect have been followed up with a program of metallic screen fire assays on select samples. Samples were chosen for metallic screen analysis either where visible gold mineralization ("VG") was observed in the core, or adjacent to VG occurrences, or where the initial fire assay results did not appear to be representative of the level of gold mineralization observed in the core. A larger sample size of 1,000 grams ("g") is being utilized for these metallic screen fire assays (as compared with the 50 g sample size that was used for the fire assays). A comparison of the results of the initial fire assay program with the fire assay results incorporating the metallic screen fire assay re-runs is presented in Table 1 below. *Fire assay results for holes MI-18-001 to MI-18-006 (inclusive) were reported in the Company's previous news release dated August 20, 2018. In addition to drilling the Miller prospect, the Company has completed seven diamond drill holes at the Eaglelund prospect, and one diamond drill hole at the Miles prospect (see Figure 1 below), for a total 2018 summer regional drill program of 688 metres. This completes this phase of the Company's regional drill program at Goldlund, and assaying is currently underway for these eight holes. Collar coordinates reflect final surveyed locations. The QA/QC program for the 2018 regional drilling programs at Miller, Eaglelund and Miles consists of the submission of duplicate samples and the insertion of certified reference materials and blanks at regular intervals. These are inserted at a rate of one standard for every 20 samples (5% of total) and one blank for every 30 samples (3% of total). The standards used in the 2018 regional drilling program consist of 5 different gold grades ranging from 1 to 9 g/t Au, and are sourced from CDN Resource Laboratories in Langley, BC. Blanks have been sourced locally from barren granitic material. Field duplicates from quartered core, as well as 'coarse' or 'pulp' duplicates taken from coarse reject material or pulverized splits, are also submitted at regular intervals with an insertion rate of 4% for field duplicates and 4% for coarse or pulp duplicates. Additional selected duplicates are being submitted to an umpire lab for check assaying. SGS also undertake their own internal coarse and pulp duplicate analysis to ensure proper sample preparation and equipment calibration. Dr. Chris Osterman, P.Geo., COO of First Mining, is the "qualified person" for the purposes of National Instrument 43-101 Standards of Disclosure for Mineral Projects ("NI 43-101") and he has reviewed and approved the scientific and technical disclosure contained in this news release. On January 9, 2017, the Company announced an initial mineral resource estimate for Goldlund that was prepared by WSP Canada Inc. in accordance with NI 43–101. At a 0.4 g/t Au cut-off grade, the Goldlund deposit contains pit constrained Indicated Resources of 9.3 million tonnes at 1.87 g/t Au, or 560,000 ounces of gold. At a 0.4 g/t Au cut-off grade, the Goldlund deposit contains pit constrained Inferred Resources of 40.9 million tonnes at 1.33 g/t Au, or 1,750,000 ounces of gold. The technical report for this resource estimate, which is titled "Technical Report and Resource Estimation Update on the Goldlund Project" and is dated February 7, 2017, is available under the Company's SEDAR profile at www.sedar.com, and is also available on the Company's website at www.firstmininggold.com. Forward-looking statements in this news release relate to future events or future performance and reflect current estimates, predictions, expectations or beliefs regarding future events and include, but are not limited to, statements with respect to: (i) the near-term potential to expand the existing Goldlund resource; (ii)the potential for the existence of significant gold mineralization 10 kilometres from the current resource area at the Goldlund project along the property's 50 kilometre strike length;(iii) the completion of metallic screen fire assays; (iv) assaying of the seven drill holes at the Eaglelund prospect and one drill hole at the Miles prospect, and the results of assays; (v) the estimated amount and grade of Mineral Resources at Goldlund; and (vi) the potential for exploration upside at Goldlund. All forward-looking statements are based on First Mining's or its consultants' current beliefs as well as various assumptions made by them and information currently available to them. The most significant assumptions are set forth above, but generally these assumptions include: (i) the presence of and continuity of metals at Goldlund at estimated grades; (ii) the capacities and durability of various machinery and equipment; and (iii) success in realizing proposed regional drilling programs. Although the Company's management considers these assumptions to be reasonable based on information currently available to it, they may prove to be incorrect. By their very nature, forward-looking statements involve inherent risks and uncertainties, both general and specific, and risks exist that estimates, forecasts, projections and other forward-looking statements will not be achieved or that assumptions do not reflect future experience. We caution readers not to place undue reliance on these forward-looking statements as a number of important factors could cause the actual outcomes to differ materially from the beliefs, plans, objectives, expectations, anticipations, estimates assumptions and intentions expressed in such forward-looking statements. These risk factors may be generally stated as the risk that the assumptions and estimates expressed above do not occur as forecast, but specifically include, without limitation: (i) risks relating to variations in the mineral content within the material identified as Mineral Resources from that predicted; (ii) general risks related to exploration drilling programs; (iii) developments in world metals markets; (iv) risks relating to fluctuations in the Canadian dollar relative to the US dollar; (v) management's discretion to refocus the Company's exploration efforts and/or alter the Company's short and long term business plans; and (vi) the additional risks described in First Mining's Annual Information Form for the year ended December 31, 2016 filed with the Canadian securities regulatory authorities under the Company's SEDAR profile at www.sedar.com, and in First Mining's Annual Report on Form 40-F filed with the SEC on EDGAR.